From cutworms to deer…my experience thus far as a member at the community garden near my new home leads me to understand that I have a few different challenges than I did at the “old” place! We never had to worry about deer at the other community garden (baby jackrabbits sneaking under the fence and vandals, yes, but not deer). I am so surprised that deer would venture out so close to the commuter trains and buses and shops, but let’s just say I won’t get many beans this year. Oh well. Next year I will plant the beans in pots and set them on my balcony instead. Unless the critters have wings, the plants should be safe with that set-up. The cards got me thinking, however. While working in your garden, have you ever found anything unusual or interesting, something that seems a bit out of place? I documented the weirdest (and most dangerous) thing I’ve ever found in this post, and here’s a fascinating link to a list of oddball “garden treasures” for fun and inspiration. 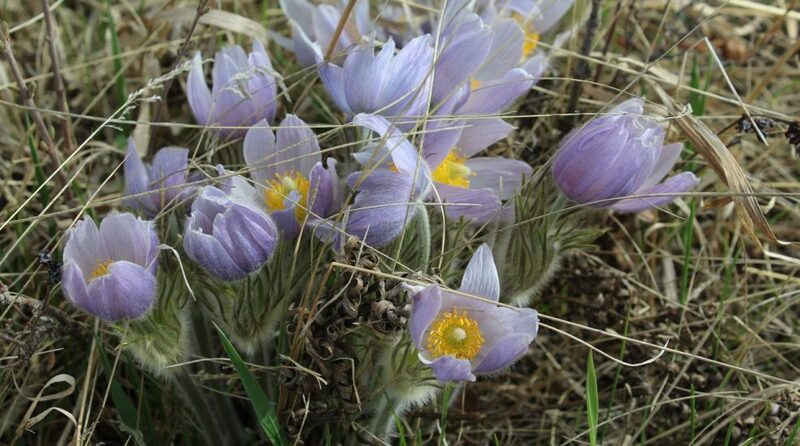 This entry was posted in Alberta, Botany, Calgary, Canada, Flower, Food, Gardening, Plant, Plant pests and tagged Buried treasure, community garden, Deer. Bookmark the permalink. ← Recipe: Saskatoon berry drink mix, two ways. I’m glad you enjoyed! I couldn’t believe some of the garden “finds” in that link, pretty amazing! This isn’t exactly “garden” related, more like “orchard”. Anyhow, this past week I saw one (or more, they all look alike) deer casually munching peaches off my tree. Last year they got all of them, so I was on the lookout early this year. Most of the peaches were in the almost-ripe stage, so I took advantage of the fact that a huge, long rather than square, box had just delivered some art materials to me and remained available for alternative use. I picked at least 200 peaches off that tree, spread them around in the box, closed it up and waited. Fruit fly trap nearby. The pests are never-ending it seems. Anyhow, peaches ripened, and now, 2 quarts of peach ice cream, 3 quarts of peach jam, and 6 quarts of canned peaches later, I’m done. Fantastic idea and wonderful harvest! Lots of work to can and process but totally worth it! Oooh, that is interesting! It would be fun to find fossils in the garden, I think! the old ring on the carrot story!! And yes deer are a real problem on Gabriola island, esp. when many people feed them. They are not afraid at all, and are very bold! I found my rose bush was still alive after 3 years and was babying it, one little bud formed, and the next day, MUNCH! It knew to walk right up to it and eat that little rosebud! Even Gabriola Island isn’t a deer-free zone? They are everywhere! And they’re devious and clever…. Sheryl, no — but our dog once dug out a lovely old plate from under the lawn. I’ve never found a plate in the garden or lawn! Maybe I need a dog to dig one up for me… 🙂 Do hope you’re doing well, I haven’t had a chance to keep up with blogging but I did catch somewhere that you’ve been injured. I hope your recovery is going smoothly. The cards made me smile! Yep, I’ve found some pretty odd stuff – an ex-helpers left over sandwich and chicken leg buried in the salad patch was luckily found by me and not the fox. At the little house in the big woods, we have critters aplenty, and a fenced-in backyard, which keeps most of them out. Any chance of fencing in the community gardens. Too expensive? Can’t like this…They are determined, that’s for sure. Hmmm…I’ve had a milk crate thrown in, some bamboo stakes, innumerable empty bags and quite a few beer bottles…rabbits, by the way, just love bean plants…Sorry you’ve got deer. They are quite the pest.